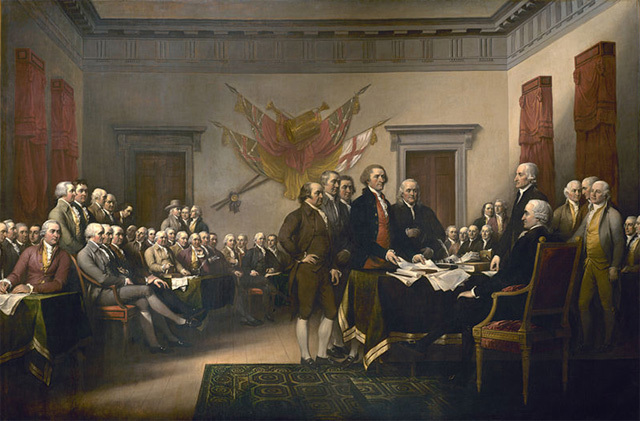 In John Trumbull's famous depiction of the signing of the Declaration, Witherspoon is the second seated figure from the (viewer's) right among those shown in the background facing the large table. 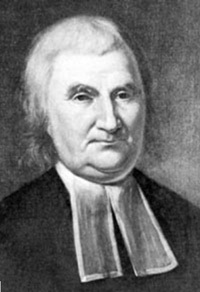 Welcome to the John Witherspoon Foundation (JWF), an initiative seeking to reintroduce every aspect of Witherspoon's life and teaching to the public square. The areas of relevance include theology, moral philosophy, Scottish "common sense" realism, politics, education, economics, classical studies and rhetoric, among others. Through conferences and a diverse array of events, the JWF will explore the potential applications of Witherspoon's thought, teaching and entire milieu to the challenges of contemporary America. (Our listserv is available under "Upcoming Events" and sparingly sends out intermittent notifications for new conferences and other major events.) Please explore the tabs to the left, and enjoy your time on the site! The John Witherspoon Foundation was initiated by the vision, enthusiasm and generosity of its Honorary Chairman, Theresa Khuri, who passed into eternity on August 19th, 2012. Grateful acknowledgement is made for her luminous life, which touched so many hearts.